Circumstances of Life or Promises of God? I choose to stand on the promises of God. The circumstances of life are just way too precarious and unpredictable for my feet to stand firm. How about you? Circumstances of life or promises of God? Easy to choose an answer to this question and so much harder to live out when your circumstances of life are hitting you one right after the other. And yet, His promises stand true forever. It’s Monday and I am 2 weeks post surgery. Cannot express all my thanks for those who are frontline with me in this recovery and for all those who have helped to carry me in any way, with food, flowers, cards, candy, care, visits, prayers, even tough love in PT and OT. It is quite painful (they weren’t kidding!!) but I am stronger everyday. There are special moments that stand out so far. Like Kenzie, sitting beside me and sprinkling my forehead with soft sweet kisses whispering over and over that she loves me so much and it won’t be long before I will be racing and jumping with her. She has been so concerned for her Mimi, she has brought me an army of stuffed animals, flowers, pictures, hugs and kisses to help with recovery. Like my Mom and Dad coming to the stairs every night to hug, say I love you and watch me climb those steps every time. You’ve been my biggest cheerleaders from my earliest memory and you still are. Love you two. And the food my mom is making. Who could not recover!?!? Like my sweet beautiful sons, Matt and Drew taking days off from work to be with me and help me walk and read to me and just love their Mom through it. Matt, spending the night with me in the hospital and watching a Cary Grant movie with me. Drew, who ever so gently reminded me that we still have a few more exercises to do and how great I am doing. Thanks to Becca for encouraging me with words, food and visits. Like my sweet husband, Andy, who loves me so well, & who is always, always working to keep me comfortable and motivated and ready to let me cry it out when I need to. You are there in the middle of the night through thick and thin. Like Sharla, spending my first night post surgery with me and listening to all my silly, crazy talk and snacking at 3 am, and for the love you always give. Like my small group, who have visited and brought food and cheer and ice and love.....and chocolate. you have truly lived the 2nd Mile with your visits, meals, ice, and love. 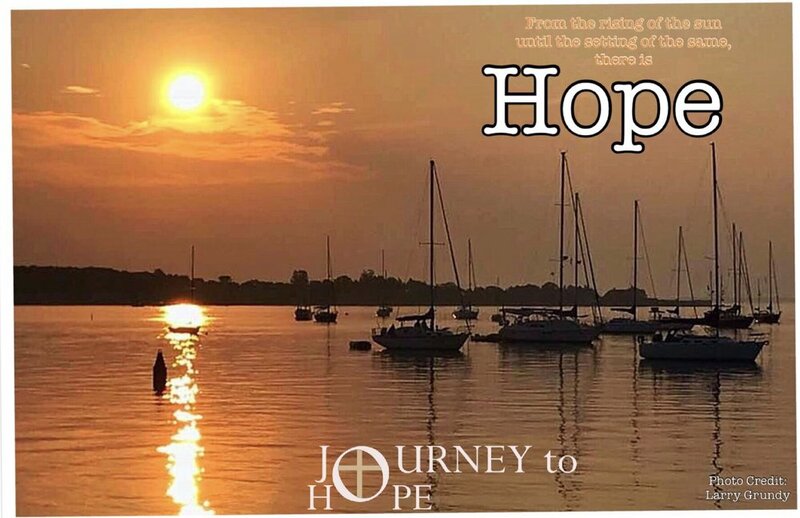 Like the Journey to Hope staff, full of encouragement and love and sending it my way. Like friends and neighbors, who have taken the time to come by with flowers, food, ice, texts, emails and shout out words of encouragement. Like my friend, Julie giving Bella a play date the day after I got home. And our dog walker, Christine, going on extra walks and giving the Goldens so much love. Like my beautiful Goldens, who never leave my side. Their love and care is so pure. They are very alarmed when physical therapy makes me yelp. They come running. And our cat, Emma who has taken up residence in my lap. P.S. hours for this week. I am holding phone and video sessions out of the office this week. I am very responsive to texts, emails and phone calls. Please reach out at 540-760-3577 if you need to speak to me and I will respond as soon as I can. Normal counseling hours resume for me Monday, August 27th, 2018. Carlie will be in the office this week on Thursday, August 23rd. One of the things I have been looking forward to the most in the days after surgery was reading Unshakable Hope by Max Lucado. It released August 7th, the day after surgery. It is proving to be quite perfect reading for such a time as this in my life. As I pick it up each day, there are wonderful reminders that even when my circumstances are not optimal, or fun, and are downright painful, God’s hope remains. I said yesterday that my weariness is no match for God’s strength and reliability. He is the most faithful to His promises, and my soul is lifted because I know Him. I trust Him. I can rest in the fact that these hard days after surgery shall pass. Today I spent some time thinking of Psalm 113:3 , “From the rising of the sun to the place where it sets, the name of the Lord is to be praised.” There is nowhere in between the beginning and ending of my day that God is not with me. His presence surrounds me in the darkness breaking to dawn, at midday, and as the sun says good night to another day. His presence with me and promise to never leave me breathes Hope into me. Enough for each day and so much more. I pray for you to experience the hope of His presence. And then a wonderful friend from Connecticut posted this picture as he started his work day in Connecticut. It was such a beautiful moment to capture and perfect for this blog. Thank you, Larry, for giving me permission to use your beautiful picture. Good morning. I am beginning to share some of the promotional posts for Max Lucado and his new book Unshakable Hope this morning. I don’t know about you but I need some this morning as I navigate stairs and walking with my new knee. Looking so forward to this journey into the world of my favorite word this side of heaven…HOPE! Reaching out to you today to let you know that my knee surgery was successful! Thank you for all the texts, calls, well wishes, and prayers. We will post each week until I return with our office hours. Please email or text if you need to and we will respond as soon as we can. The things you are facing in your life are also very important to us. We will be praying for you as well. Praying for hope to break through in your life, even in the middle of storms.